I think my work life is destined to be complicated until June. I'm getting through it but it can be rough. Outside of work I had a big disappointment last week. Something I had hoped for will not occur and I am sad about it. I cannot say more, but, just before it became apparent that I would not get what I wanted, a man stopped me on the street - busking. He attempted the Star Spangled Banner three times until I gave him a dollar and told him it's too difficult a song. But I want to sing for you, he said, and he did have a very beautiful voice. Try something you're more comfortable with, I told him and he did a little hymn. He had a bible in a black plastic bag. I just feel like that wasn't enough to give you, he lamented. I have a lot on my mind right now, you've given plenty, I'm distracted...I told a perfect stranger. He was tall and had beautiful eyes. He just looked at me for a second and said: You are blessed. And, right now, while I stew a bit over the thing I wanted, I realized how blessed I am. 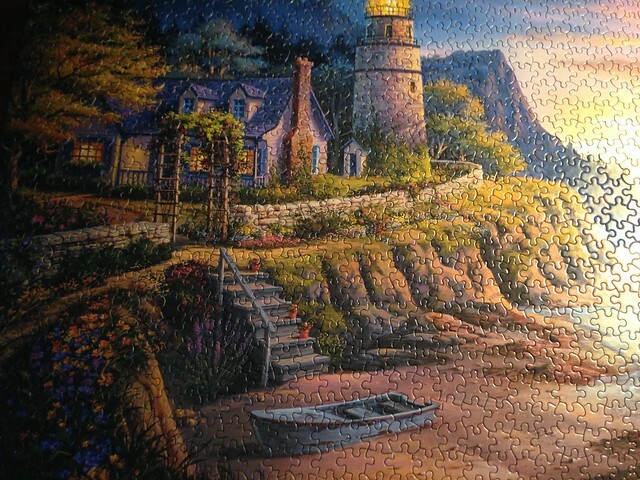 I finished a new puzzle. Today, I'll take it apart and re-build The Majestic Lions. The sunshine is warm, I have laundry to do. We are looking forward to attending a wedding on May 9th and have booked a return trip to the wonderful house I took K to for his birthday. All's well in my nest. I'm sorry. Doors close, doors open but the bit in-between is a pain. Jigsaws. I'm not feeling the love but I am glad that they make you happy. If you have some spare time you could always come and do my ironing. Acknowledging how blessed we are while still wanting more or being disappointed about that which has not happened is a funny human quirk. I am sorry that the thing didn't work out and I am grateful that you live in Tuvalu where wonderful things happen like being sung to in the street. 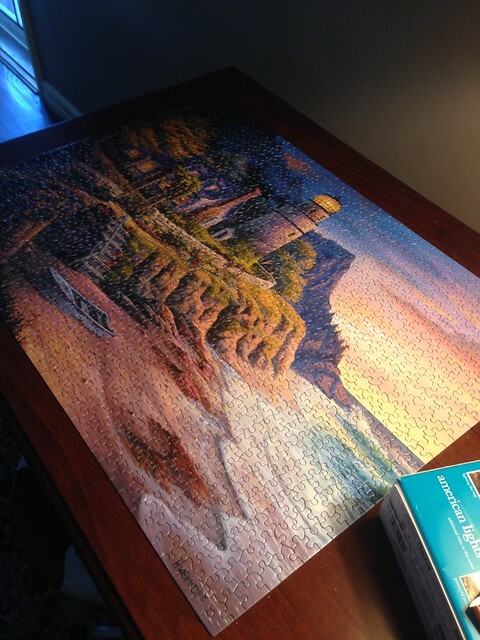 Happy puzzling. what room do you puzzle in? Don't feel bad. I ALWAYS want something lately and I NEVER get it. Hence, I am always sad and bleah. Yes, I've become a bitter old lady. I'm so sorry things didn't work out the way you wanted (this time, there's always tomorrow). It's lovely that you got such compassion from a total stranger (and you are able to appreciate it, no small thing).